Dr. David Ores poses in front of his office at 189 E. Second St. on July 28, 2014. EAST VILLAGE — An East Village doctor raised more than $34,700 from his patients and supporters in just five days after he asked for help in keeping his practice open. 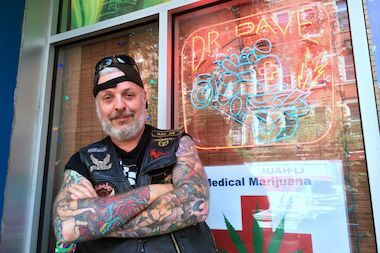 Dr. David Ores, a 55-year-old motorcycle-riding tattooed physician, set up the online fundraising campaign on July 22 after his landlord told him to pay tens of thousands of dollars in back taxes that he didn't know he owed for his office at 189 E. Second St., he said. "It was like 'It’s a Wonderful Life' when they helped the guy get the money back," said Ores, who hopes the funds he's raised will enable him to reach a deal with his landlord. "It's nice to know that people care." More than 660 people responded to Ores' call for help, many of them former patients who said they were grateful that he offered health care to everyone who walked in his door, regardless of their ability to pay. "Dr. Dave took care of me when I was broke, sick and without health insurance. He is a modern day hero. There needs to be more compassionate doctors like him," wrote Yasue Yan, who gave $40. "This is the least I can do," wrote Brian Shuman, who donated $15. Ores, who founded a health care cooperative that gives uninsured restaurant workers free access to doctors and a nonprofit that removes tattoos for former gang members, moved to his current office four years ago and signed a lease with the Lower East Side People’s Mutual Housing Association, Inc., a nonprofit affordable housing group. Ores remembers the lease saying he wouldn't have to pay property taxes because the building had a J-51 tax break, but the building does not have one, according to the city and the LES People's Mutual Housing Association. Ores previously had an office on Clinton Street, also leased from the LES People's Mutual Housing Association. That building did have a J-51 tax break, so Ores didn't have to pay property taxes there, but that changed when he moved to East Second Street, said Rona Clemente, the housing association's executive director. The housing association reached out to Ores several times in the past year to tell him to pay the taxes but did not receive a response, Clemente said. Ores, though, said he asked Clemente if he could set up a payment plan but never heard back. The nonprofit covered Ores' property taxes to avoid penalties but then took Ores to court this spring in an effort to get him to pay. “We don’t want to evict Dr. Dave. The only reason we started this case is to start [getting] a payment in court,” Clemente said. Ores said he didn't know about his court date this spring and only found out how serious the case had gotten when he recently received an eviction notice and a court order to pay $30,917. Attorneys for both sides met in court Tuesday and will try to negotiate a settlement, Ores said. All money he raised will go toward paying back the housing association for the taxes, he said. Ores added that he wasn't upset with the LES housing association, where some staff members are his patients. "I just want to make sure what’s happening is fair," Ores said. "If they messed up, we’ll help them. If they didn’t mess up, then I have to pay taxes."